Now this sure isn't one of your step-by-step how-to stories. If the idea of thinking laterally and creatively gives you a headache, press the browser's 'back' button. 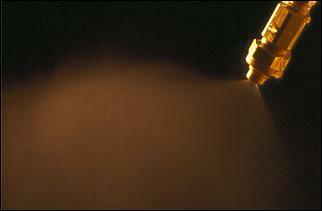 But if you're the kinda person who likes to grab the germ of an idea and run with it - this is for you. So what am I on about? What we have here is a digital counter, a device which can display a count-up in response to an event happening. A bit obscure? OK, let's say that you circuit sprint your road car for a bit of weekend fun. The tightest corners are left-handers, and you're pretty convinced that your right-rear is bottoming out several times each lap. Oh yes, so is your car's suspension. While you think it might be happening pretty frequently, maybe it's occurring only once per lap? How do you find out? Well, it's easy. With our famous $10 Digital Counter and a simple $2 microswitch, you can count exactly how many times the full suspension travel is used up. Just cable-tie the microswitch on the suspension somewhere so that it is triggered on full bump, and connect it to the $10 Digital Counter. Press a few buttons, head out onto the track and when you come back to the pits and have time to draw breath, just read it off on the display. That's just one use - I'll come back to some others a bit later. But what's he on about anyway? 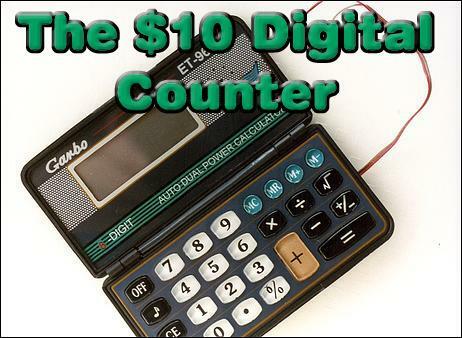 Just what is this $10 Digital Counter? After all, a decko at the pic at the top of this screen could have you believing that it's just a calculator - one in this case with the pretty pleasant name of 'Garbo'! Well, it is. Nope, not a Garbo - well, it is indeed that in name, but not in function - but a modified calculator. That's why it's just so damn' cheap. Now since this is the single big-ticket item on the shopping list, select it with care. After all, a $12 calculator will blow your budget by a massive 20 per cent.... 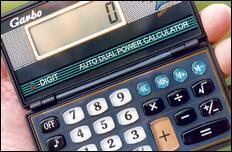 But as well as the financial outlay, you also need a calculator that functions in a particular way. And not all calculators do - function the right way that is. Don't believe me? OK, grab the nearest calculator. Turn it on, then press "1 + 1 =". 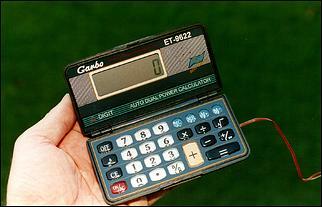 Yeah I know that every calculator will now display "2", except of course those obscure Hewlett Packard designs with Reverse Polish Notation - but if you own of those you are a dork, dweeb, wear thick glasses, did a B Eng at uni, and basically should be able to design and build your own digital counter out of a packet of matchsticks and a single banana. OK, so for those who don't own a calculator with a weird 'Enter' button, you'll now have pressed "1 + 1 = " and be staring down at "2". And now here's the tricky bit. Without doing anything else, again press the "=" button. What happens? On some calculators, the answer will stay at "2". If your calculator does this, take it out to the shed, select a large hammer, and destroy it. It's not the type you want. But if your calculator increments to "3" - and then when you press the "=" button again, to "4" - congratulate yourself as you have the right design. Cos you see, all that you need to do to make this type of calculator into a digital counter is to make the 'equals' sign operate every time that you want to count up. Easy, huh? This sorta Digital Counter Functionality (DCF) kind of test is easy to do in the shop before you splurge your last hard-earned, too. Like, with the superb pictured Garbo (being sold from the counter of a petrol station) I tested out its DCF in front of half a dozen indifferent customers, the console operator, and the knowing eyes of the semi-naked women peering out from the covers of four cylinder magazines in the display rack. But for DC uses, make the drawing. After that, disassemble the calculator, revealing the copper tracks that lie behind the keys - specifically the "=" key. You'll soon see that when the button is pressed, its graphite rear coating bridges the path between two different printed copper patterns - in other words, pressing the button closes the switch. Using a very fine soldering iron and thin insulated wire, solder a wire to one of these conductors, and the other wire to the other conductor. This means that when you join your wires together, you are performing the same operation as pressing the "=" sign. If you are very careful where you solder the new wires, the calculator's own "=" sign should still work OK as well. Make a small hole for your wires to escape from the case and then re-assemble the calculator. Check that all the keys work as they should, then do the DCF test ("1+1=") and touch the ends of the two wires together. The screen should then change to '2', and then each time that you join the wires, the DC will count up another unit. There are two ways of triggering the Digital Counter. A switch that closes each time an event occurs (eg the microswitch clicking when the suspension reaches full rebound) can simply be connected straight to the Digital Counter input. However, if you want to count whenever something is turned on (eg an intercooler water spray pump) then you'll need to use a 12V relay. Connect the relay's coil in parallel with the load (eg the pump) and then connect the relay contacts to the Digital Counter so that the counter is triggered each time the relay turns on. Full suspension movement events (bump or rebound) - using a microswitch on the suspension. Lap counter - press a switch each time you do a lap so that you actually remember to come in when you're supposed to. Plenty of stuff to be thinking about!